We've got some wonderful eye candy and blog candy in store for you! Well be unveiling four brand new dies and dozens of ideas. 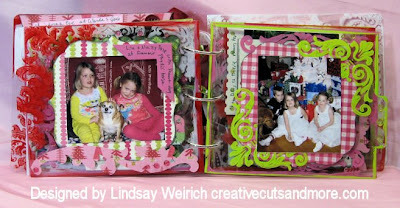 Creative Cuts and More is proud to be the sponsor if this week's challenges at 2 Sketches 4 You. Their designers made some wonderful samples with our products. Click here to see them. The 2S4Y blog has details on how to participate in their challenge. Who knows? You could be the lucky winner of a $20 gift certificate to our store. First I want to say thanks to you for sticking with me this far! At this stage we have all of our paper and photos in our book on beautifully stamped clear pages. Now let's put our book together and add a few more touches. 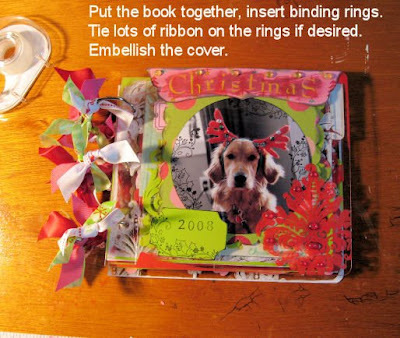 You will need the 3 binder rings that came with your album, ribbon (lots of it), buttons, glue dots, dew drops (to make them for free click here) and anything else you would like to add. Actually all of this stuff is just the icing on the cake, you can simply add the rings to your book and call it good but if you're a "Fancy Nancy" like me you will want a bit more icing on the cake...er, I mean book! First attach the rings and tie ribbon on them. To save ribbon tie it on while still on the spool, then trim it the length you want, then you just have to trim the first end. 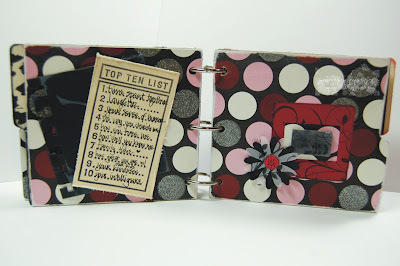 Add buttons, sparkles and anything else you want to the pages. 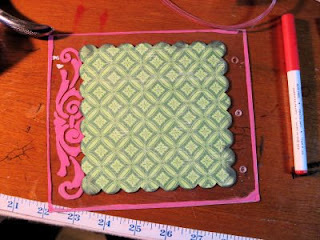 To learn how to make glue dots for pennies click here. I love putting the dew drops on the clear pages because you can see the pretty gems from the other side too! And now, drum roll please, here is the finished book! 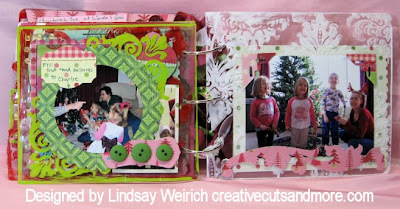 This is the 2nd segment of a 3-part tutorial on making a 6"x6"clear album, for part 1 click here. 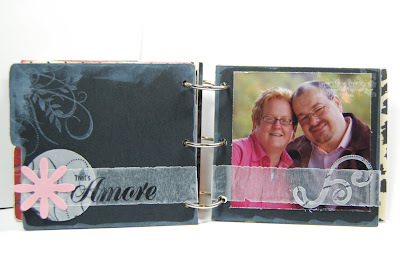 Now you have your clear album with one side of all the pages stamped. Great! Now on to what I call the paper phase! 3 1/2" square photos on a sheet of 8 1/2"x11" sheet of photo paper. Don't spend a ton of time fussing with your shots, just get them printed. I keep a red eye pen by American Crafts handy to erase any red eye but that is about it. You will need double sided pattern paper, I love this Christmas pad of paper from K&Co, It was so hard for me to use before because both ides of the paper is so yummy I felt bad about one side not showing but with the clear album you get to see both sides, how cool is that!?! You will also need stamps, ink and the chipboard you painted yesterday. Paper punches are handy for making small accents as well. 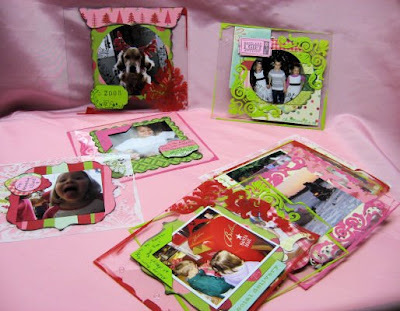 I chose 3 simple shapes to "mat" my photos, I cut all of the paper a head of time. I used 4 1/2" scalloped circles, squares and a bracket edge shape. 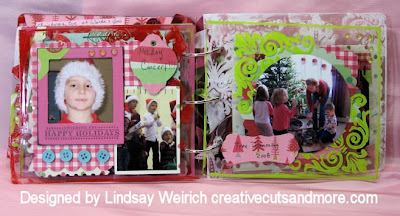 I also cut out tags and photo corners to use. Let's get sticking! I used CLEAR double stick tape to attach my photos and paper. Don't cover the entire page, leave areas of the page exposed so you can peek through to the next! Also: DON'T FORGET TO REMOVE THE FILM FROM THE CLEAR PAGES! I made up a catchy rhyme to help you remember how to layer them, the "front" refers to the stamped side of the page: "Stick a photo to the front, pattern paper on the back, and another photo on top of that" Alright, It doesn't exactly rhyme but you get the idea. Add another photo on top of that! For sticking on dainty bits of paper I used small home-made glue dots and they are as good as store bought, you can read my tutorial here. 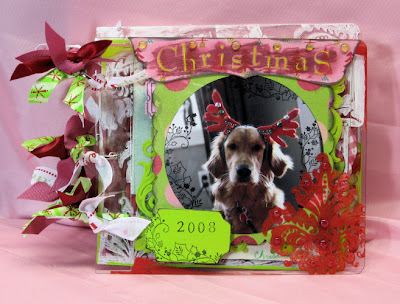 As you go you may want to stamp on the chipboard or directly on the photo or plastic page. 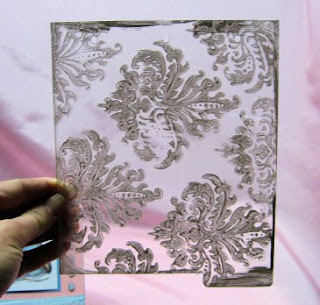 Use StazOn ink for this, for inking the edges of paper use the chalk ink. 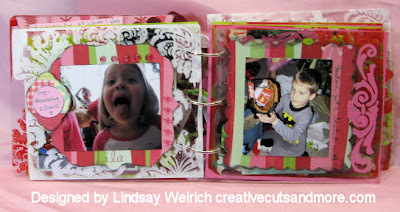 Here are pages with paper and photos, step 2 done! YAY! 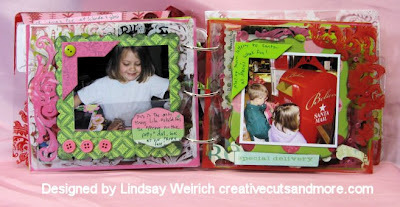 One more thing, to keep this album fast and fun hand write your journaling! Use Sharpie (or any other permanent marker) directly on your page. I'll be back in a day or two with the finished album, I tickled with how it came out, I hope you will like it too! Thanks for stopping by! Here's another mini album idea! 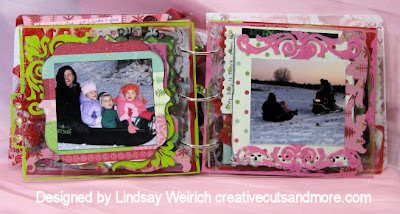 This 4x4 album is a great little album that you can alter, distress, try out new embellishing ideas or just give as a great little gift! I did this one as a celebration of our 12th anniversary. 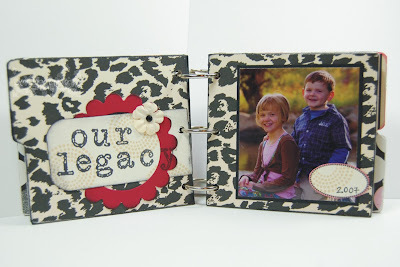 It was fun to just put some memories together in a little album! The antique label on the front can be found here. 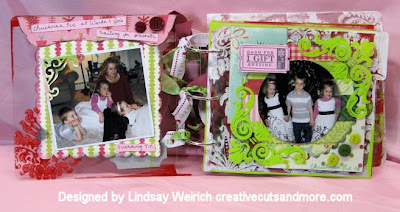 The flourish is a little die cut (from my personal "collection") by Sizzix. The alpha set is Tiny Alphabet by Stampendous. This layout not only features some hand cut letters, but the scalloped circle frame can be a very versatile embellishment. I used it in the following layout too. The letters were made by using chipboard letters, laying a sheet of cardstock over them and running them through my personal die cutting system (BigKick by Ellison) and the flower is a hand punch by McGill. The alphabet letters are from Cornish Heritage Farms, the circle stamp was from Gel-a-Tins. (A set called Sheltering Trees.) The oval was hand stamped with a stamp from 7 Gypsies and then I hand cut it. 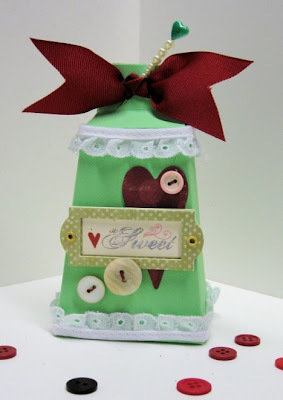 Besides using die cuts as embellishments, a great way to add some variety to those die cuts is to use your favorite stamps to stamp on them. The flourish is a Hero Arts stamp and the sentiment is from Prickley Pear Rubber Stamps. 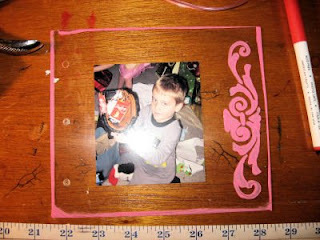 The rectangle in the middle is a Tim Holtz Fragment. I used my sanding block on one side of the clear acrylic chip, making it look frosted. 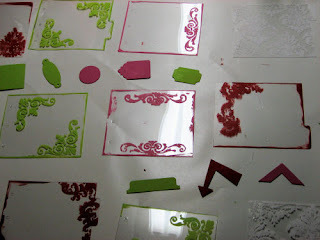 I then embossed on it using Versamark and clear embossing powder. (Don't hold the heat on it too long at a time!) 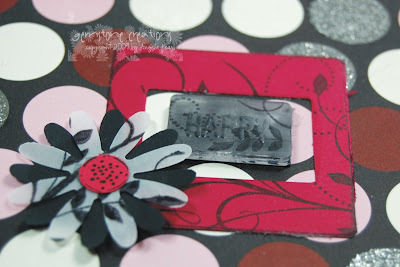 I also stamped on it using Black StazOn ink. Hope you have enjoyed these ideas! 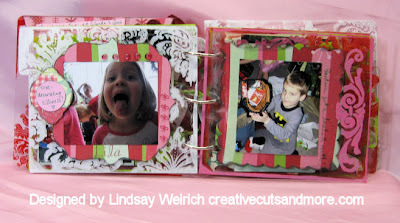 This is a fun and versatile little book...hop on over and check it out! 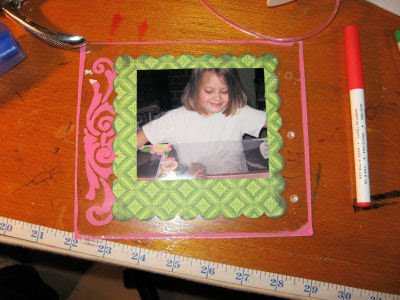 Have you seen the cute clear albums that are all the rage these days? Have you ever wanted to try making one? Here's your chance. I used a clear album from Creative cuts and more for my base. Today we will do step 1. 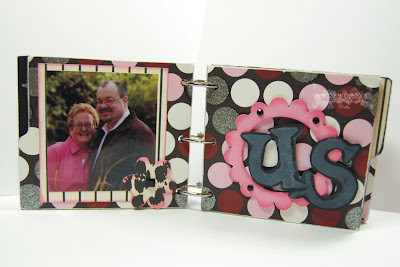 You will need a clear album, foam stamps, foam brushes and acrylic paint. To begin remove the plastic film on the front side of the album page. 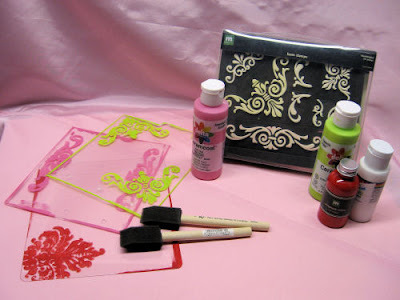 Squirt a bit of paint on to a piece of waxed paper and use a foam brush to "ink" up your stamp and press it on the album page. Lift the stamp strait up and try not to wiggle it at all or you will have a blurry image. Don't worry if it's not perfect, it's just an opportunity for embellishing! Drag the brush along the edges of the page if you want to give it an inked edge and set aside to dry. Repeat with the rest of the pages. DON'T FORGET TO REMOVE THE FILM BEFORE YOU STAMP THEM!! 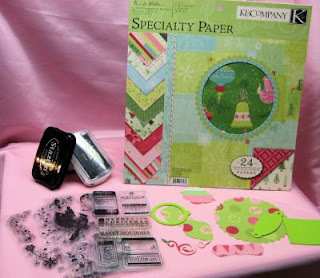 While you have the paint and brushes out look in your assorted chipboard stash, grab some shapes that would work in your album and paint them, you can swipe paint on sheets of stickers too if you want to use them but don't have just the right color for your book. 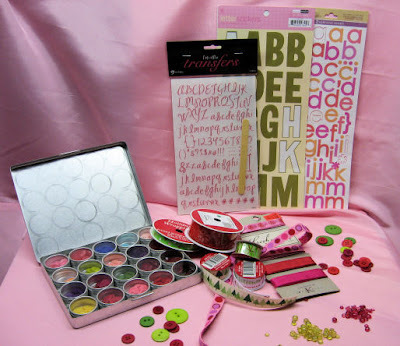 Acrylic paint is an inexpensive way to update and coordinate your supplies. Now clean your stamps and brushes (just because they are called disposable doesn't mean you need to toss them after each use, they will last quite a while!) I keep an old toothbrush under the sink to clean my stamps, I squirt on a bit of dish soap and they are as good as new! How adorable! 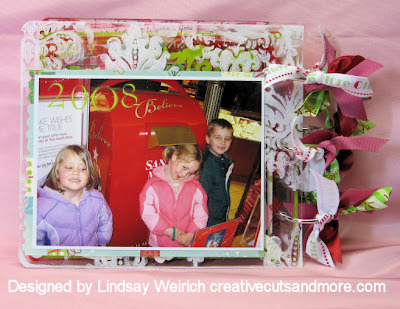 This Bell Box is cut from Bazzill Criss Cross textured cardstock in Katydid. 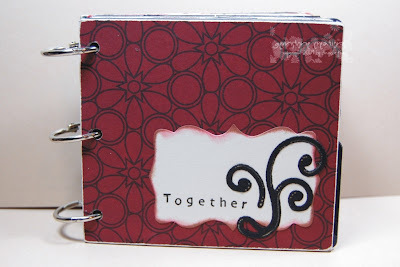 TIP: The Criss Cross textured cardstocks from Bazzill are dyed to match products from Doodlebug! This pretty green is such a fun non-traditional choice for Valentine's Day, isn't it? And she added vintage buttons and a sewing pin with faux pearls strung on for an embellishment. Here's a fun gift for a new homeowner, or someone striking out on their own for the first time. 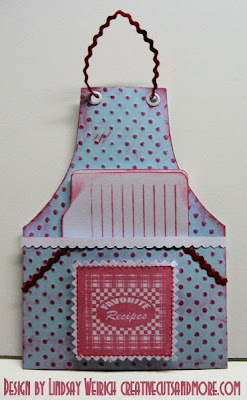 An Apron Pocket A7 Card filled with favorite recipes. Pair it with a cookbook and a real apron and you have a lovely present for a new homeowner, bride or even a neighbor. Stamps are by Inque Boutique (Recipe set) and the card was dry embossed with a Fiskars texture plate and inked before assembling. What a cute card from Jenny! 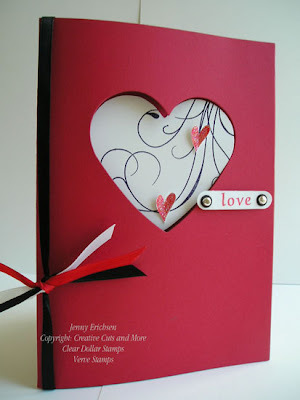 This lovely valentine is an A7 Heart Window Card cut from Bazzill Smoothies in Cherry Splash. Jenny traced the heart window onto white paper, cut it out and stamped some CDS Florishes on it. She then put it inside the window of the heart. She also stamped and cut out some hearts, then added some Crystal Effects and glitter to them and attached them with glue dots.